Home by 9:30. What a day. Really cold last night in Estero. Lows in the low to mid 40's. Burrrrr. Really nice today with highs in the mid to upper 60's with clear skys. However, really light sales today. Good crowds, but no action. Pack up was pretty painless. I spoke with the glass blower today. He suffered 5 broken pieces and 10 stitches. He seemed none the worst for the ware. We were on the road by 7PM and home by 9:30PM. We stopped at he Maines Best Lobster house and had a bowl of cream of crab soup. We are really beat. The Swamp Cabbage Festival was held this weekend in LaBelle. I can't wait until tomorrow to hear how that went. Wet day in Estero. Rain started at around 1PM and by 3PM it was torrential. We ended up getting drenched, and had to return to the Scamp to get changed into dry cloths. We sold a really good commission (after selecting the panel type and glass color, the customer returned to the show with the cabinet doors), and a large Panel Number 9. We are set up next to Jimmy & Connie Langford, and just behind us are the Becks (Larry & Donna). We had near tragedy strike a fellow artist. During the downpour, we experienced high wind gusts, one of which blew over a glass blowers display, causing it to break. He received quite a nasty gash down his leg as a result. The Ambulance arrive, and hauled him off to the emergency room to get stitched up. We hope for the best, and will check up on him tomorrow, to see how he fairs. Arleen's Starry Night Door Insert in a clear baroque (S100B) with Blue/Gold Chinchilla dichroic glass bevels and Blue/Gold industrial dichroic glass rondels (split). Tom & Sherry with Tom's custom mahogany frame for the Keys entry door insert. Freeze warning last night, but we only got down to 38F. I spent the afternoon covering up the plants. Lots of work in that, but better not to take a chance on a late season freeze, and have even more freeze damage. I fertilized after the last bit of freeze, thinking we were done with the deadly cold, and the trees could get a jump on leaf replacement. This instigated a lot of tender new growth that is really prone to freeze damage. My thinking was this, I noticed blossoms on the Calamondin Tree. If that old tree blossomed, than the freeze must be past us. So far the Calamondin has been right. We shall see. In addition to the cover up, I did all of the layout work on Arleen's door panel insert. I switched out four different types of rondels, photographed them, and wrote Arleen a letter asking that she make a selection. In addition to this, Tom came by with the finished KEYS door frame. We did the install (glass panel to wood frame), photographed it, and emailed the photo to Carol for approval. She will be picking it up this weekend in Estero. Tom and I discussed the possibility of him building a frame for the Starry Nights panel, as a way of creating some "wall art". Sherry spent the day on inventory, and repaired the C-66 in Fire Water Glass damaged in shipping to ???? last year. This will be returned to inventory. Today, the Langfords will stop by for a cup'a on our way over to Estero. Hopefully, the weather will hold this weekend, and we can get some big sales. It has been generally nice these last couple of days, with highs in the lower 70's and Lows in the lower 60's. However, the weather is changing again, for the worse. Tonight it is predicted to go down into the 40's and only reaching the lower to mid 60's tomorrow. We have a freeze warning for Thursday night and Friday morning. We got approval from NM today on the Egrets today, and sent final preliminary and cost budget estimates to LS on the 12' transom. Tom the cabinet maker came by today and picked up the KEY door frame. He said that he will have it ready for us by tomorrow. Sherry finished the glass today, so we are set for this weekend. I began the layout work for Arlien S's door insert. Milton Long came by for a visit. I really enjoy talking to Milton. He is a Quail Hunting Guide, and I enjoy talking shop with him. It really makes me miss bird hunting, or if not hunting, just the dog work. It makes me really want to break a bird dog. Oh well, this too will pass. Milton was kind enough to leave us with a rack of ribs and a hugh roast. 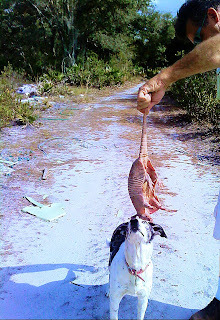 He got this hog last evening, and had butchered it this morning. Really nice of him to share his take with us. Sherry soaked the ribs in marinate, and wrapped the roast up and put it in the freezer. It started raining during our walk today, so when we returned home, I went to work on show filings. I filed for Lake Wales, Annmarie Art Fest, and Arts Alive in OC Maryland, sent off a bunch of commission stuff and generally got a lot of paper work out of the way. Jess & John and The Kids left this morning at 2:45AM. We were up to see them off. Very sad. They will be missed. We talked at about 3PM and they were deep into NC, so it sounds as if all is going well. I did book work this morning, answered commission emails, and Sherry worked on Commissions. About 3:30PM we took a walk through the scrub. The dillos are out in force. I captured one (creep up and grab it by the tail). Very cute creatures. Blue enjoyed smelling it. Earlier in the day one was rooting along the deck at the studio. Blue laid on the deck just watching the dillo dig along. Pretty funny! Our new neighbors previously owned the Endangered Species Park on Rt. 27. They are moving all of their exotic birds to their new home down the street. Killian at the shell road pond, gigging armored catfish. The catfish had nothing to fear on this day! These are the last shots taken before The Raley's and Sherry came out of the Keys. The Manatee came back for one last drink of the fresh, and everybody got to scratch its' head. Long day in Sarasota. What can I say? Not a great show. Very few direct sales, and only a few commission bites. Started packing at 5PM and was finished at 8. Loaded up the trailer and was on the road by 9/ Got in at 10:30. It was great to be greeted by Jess & John and the kids, The Blue Dog and Sherry. Ain't it good to be back home again! Cold this morning, with lows in the upper 40's. Todays' high is predicted to only reach in to the mid-60's. I began the day with a 3AM wake-up. I was set up and off the street by 7:30AM. Some light showers afternoon cut the crowds back a little bit, but we had steady crowds all day until close at 5PM. Sherry kept me posted on her way out of the Keys. I finished up the day with dinner at Detter & Delores's. The Langfords & Greens were in attendance. Detter fixed up a shrimp and mushroom over pasta dish that was delicious. Very lively conversation regarding shows. I wish Sherry could have been there. I miss her deeply. Sad to have had to leave the Keys, but it is time to get back to work! I left on Thursday at noon, drove up to Miami to pick up a door (commission I will get into later) and arrived in Palmdale at about 8PM. Got up this morning, cleaned the house, stripped the beds, did a couple loads of laundry, checked on the plants (Ethen did a great job), unpacked the truck, packed the truck, and headed out for our show in Sarasota. Tod, Gavin & Adam stopped by to say hello, as did Ethen. I gave Ethen a sawbuck for watering the plants and taking out the trash, and gave Tod a bunch of bananas for Gavin to work on (he loves bananas all most as much as I do). I left for Sarasota at about 12:45, stopped in Port Charlotte for some supplies, and arrived in Sarasota at about 3:30PM. After setting up camp, I took the bike down town to check out our space, got lost and rode the bike for about an hour until finally finding my way back to the camper. I had a great dinner with the Langfords, the Greens and Detter&Delores, and turned in for the night. Big day tomorrow, with a 3AM start. 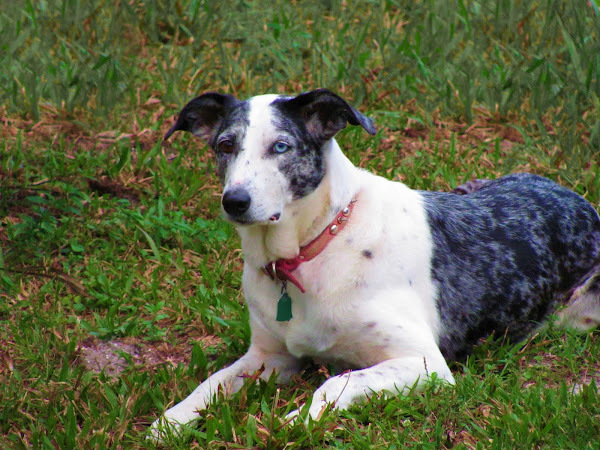 I sure do miss Sherry and The Blue Dog. Sherry does so much that goes unnoticed, little things that make my life so much easier. I miss her terribly when she is not around. 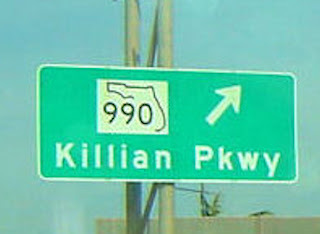 Killian gets his own Parkway! Sherry started the day with a slice of Key Lime Pie from the Key Lime Pie factory, over at the Island Shopping Center. (She was not the only one to enjoy this breakfast treat). and Savanna. These kids love to fish! Later this morning we are going either to the No Name Key bridge to fish, or Bahia Honda to play on the beach. Tonight, Jess & John are off to a Bed & Breakfast for a night alone. All in all a good time was had by all. There are not a lot of birds on Bahia Honda this time of year. Mostly gulls. But you can really get some good shots of these birds in action. We ended our outing on Bahia Honda with a walk to the south side of the Key, where we trekked up Mr. Flaglers Overseas Railroad bed, and up onto the trestle for some spectacular views of the Keys. Here the Kids are pausing for a picture on the edge of the road bead, just before we get to the top of the trestle. A beautiful view, looking north / north east from the top of the bridge. At the bottom of the bridge we pause again for a nice shot of the kids on a coconut palm, with the trestle in the distance. And the kids on Mr.Flaglers caboose. Once we finished up here, we headed over the bridge, back to Big Pine Key, for a run out to the No Name Pub for a late lunch. After a long hot day at Bahia Honda, we headed off to the No Name Pub for a late lunch. This neat little eatery lays at the foot of the No Name Key Bridge. The walls, ceilings, and just about any flat surface is plastered with signed one dollar bills. The waitress told us that there is an estimated 110,000 one dollar bills plastered to the walls in this little pub. The food here is said to be a favorite of the locals, so we ordered up fried Grouper baskets all around, plus magic markers for the kids. Sherry gave each of them a one dollar bill and told them to get to work. This is much better than the ordinary kids coloring stuff at other restaurants. and the art work was soon ready to be stapled up on the walls with all of the other artwork. We are hoping Jess & John will have a chance to drop in and see this really nice work the kids did. We also saw over a dozen Key Deer. These little deer are everywhere around these two islands. We saw some nice bucks, and played the "Count the Key Deer" game. Killian scored 1, Vanna scored 2, Sherry scored 3, I scored 3, and Madison was the Big Winner with 4. We spied these two nice bucks, just down the street from the house we are renting.